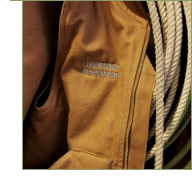 The International Livestock Identification Association believes that on line privacy is a serious matter. What Information is Collected by the International Livestock Identification Association Web Site? Your information is used for the main purpose of contact data - through communication channels such as e-mail, phones, faxes, and standard mail. It provides us with the ability to contact you via different methods of communication. The International Livestock Identification Association does not resell private information to other 3rd party corporations.